Just minutes from the historic downtown plaza this beautiful, light-filled 4 bedroom / 3.5 bath home offers a unique architectural design and breathtaking views from all directions. Enjoy home-cooked meals from the chef’s kitchen in the dining room or dine outside on the wraparound deck that leads to a rooftop landing - perfect for sunsets! The home features flat screen TVs in the family area and all queen bedrooms. A Sonos network plays music throughout and the large recreation room downstairs offers ping-pong, foosball, and other games. 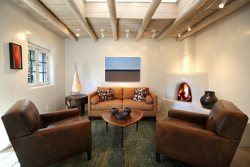 Cozy up to the large fireplace in the living room or enjoy a book from the library shelves in the family area. The master suite is a wing on to itself with a luxurious bathroom, walk-in closet, separate sitting area, and window-lined walls to mountain views. Pocket doors in the sitting area can be closed for additional privacy. Downstairs is another living room with a television and couch, two queen bedrooms with en suite bathrooms, and a fourth bedroom with two twin beds - can convert to a king! Outside, whether on the deck or in the hot tub, the views are splendid! Located minutes from the Plaza, shopping, skiing, or hiking, there’s no shortage of activities at Casa Alba!